Experiment 101’s furry, colorful, post-apocalyptic adventure Biomutant was on the floor for the PC Gamer Weekender, and the developers showed off some of the game’s character customization options, abilities, and weapon combinations. Here’s our list of the most exciting games coming in 2018. Studio head Stefan Ljungqvist demonstrated the game’s character screen, which lets you slide a cursor around a six-sided grid, with each corner corresponding to an attribute like strength or intelligence. Moving around within the shape alters the look of your character, but also changes their skills – so your character’s appearance will be a reflection of the stat loadout you pick, or vice-versa. Those stats can be buffed with level up points as you progress, making Biomutant a “full blown RPG,” as Ljungqvist says. He also showed off the game’s weapon crafting system, which lets you cobble together crossbows and makeshift rifles out of what appear to be bits of abandoned gardening equipment. There are, he says, around 500,000 possible combinations in the game. You’ll also be able to outfit yourself with bionic attachments like glider wings and develop psionic skills, such as telekinesis – all while playing a strange looking squirrel-creature that has trained in kung fu. Check out PC Gamer’s interview below. 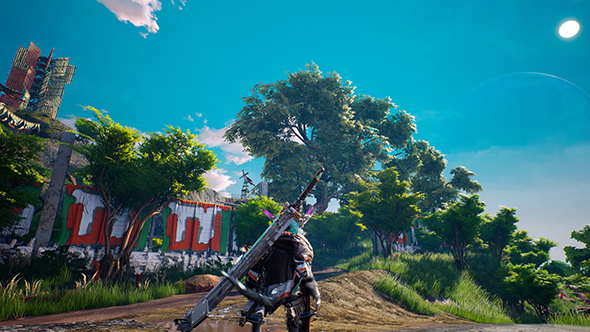 Biomutant is expected to come out later this year.